On the afternoon of May 22, 2011, a tornado with winds reaching 125 miles per hour touched down in North Minneapolis, long the African-American center of the city. The quick-moving storm uprooted trees, downed power lines and sheared the roofs from houses. One person was killed and hundreds left homeless in the biggest natural disaster to strike the city in decades. The tornado missed the house of Anthony Newby, a real-estate entrepreneur, by four blocks. New to the neighborhood, Newby joined the volunteers seeking to help struggling residents, but grew frustrated by what he perceived as the local government’s slow response. It wasn’t that he was an activist. Though he had lived in Minneapolis for years, he hadn’t been particularly aware of the deep poverty that exists in swaths of the city. But as he walked the blocks of North Minneapolis, it became clear that the tornado wasn’t the first disaster to hit there. Foreclosed homes sat vacant and boarded-up. Extended families crowded into apartments to make ends meet. Three-quarters of the residents affected by the tornado, it was later reported, had been relying on some form of public assistance. The storm landed North Minneapolis on the front page of newspapers for weeks, serving as a reminder that sections of a city long considered a bastion of progressivism had been left far behind. For Newby, it also served as a call to action. He created an online petition demanding that people made homeless by natural disasters be allowed to live rent-free in foreclosed properties. He helped found Occupy Homes, organizing the activists who camped in the yard of Monique White, a single mother of two, after US Bank foreclosed on her home. He joined Neighborhoods Organizing for Change (NOC), a community group based in North Minneapolis that was formed after ACORN’s demise. And last year, the 39-year-old became its executive director. “Look at the gap between whites and nonwhites in Minneapolis,” Newby said. “It’s an embarrassment, a crisis.” But it isn’t a new crisis: back in 2010, the Economic Policy Institute reported that the unemployment rate for blacks in the Twin Cities was more than three times that of whites—the greatest disparity of any metro region in the country. Nor have subsequent studies found much improvement. Nearly all of the children living in poverty—94 percent—are children of color. White students in public high schools have a 67 percent graduation rate, compared with 36 percent for blacks, 34 percent for Latinos and 22 percent for American Indians. Like many cities across the country, whether Minneapolis feels like a “good” place to live often comes down to the race of the resident. Yet while the statistics remain bleak, a powerful force has emerged in Minneapolis that seeks to end such extreme racial disparities. This movement is helmed by Minnesotans for a Fair Economy, a coalition that includes NOC and four other key partners: the Service Employees International Union (SEIU); Take-Action Minnesota, a network of progressive groups; ISAIAH, a faith-based coalition; and Centro de Trabajadores Unidos en Lucha, a workers’ center. 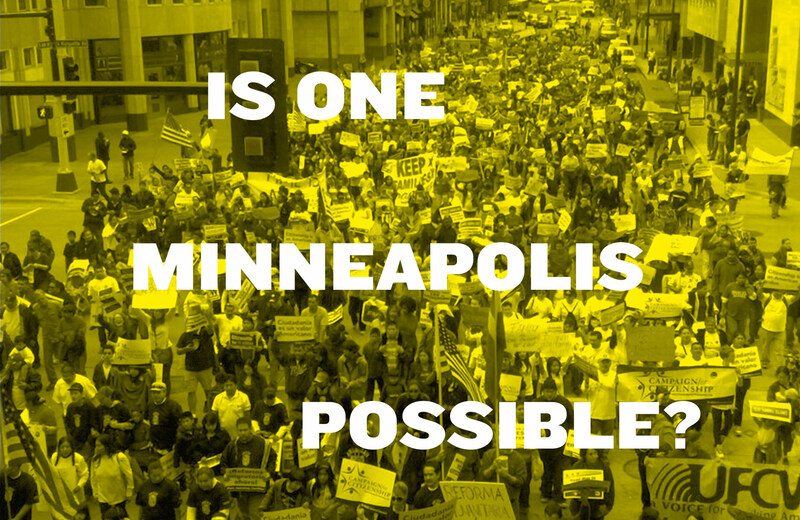 Since it was formed in 2011, this unusual coalition has become a regional powerhouse, leading the charge to defeat a statewide voter-restriction amendment and running campaigns to challenge the dominant corporate powers of Minneapolis. In the process, it has also begun to transform local politics. Last fall, with critical support from SEIU and TakeAction Minnesota, Betsy Hodges—a dues-paying NOC member—was elected mayor of Minneapolis, pledging to start the long, hard process of ending the city’s racial inequities. While Newby may be overstating the case, there is no question that the ground is shifting in Minneapolis. Last November, in the same election that put Hodges into office, voters made history by electing the city’s first Somali, Hmong and Latino City Council members. Today, 40 percent of Minneapolis residents are people of color; 15 percent are foreign-born. Hodges was an underdog from the start. The presumed front-runner, Mark Andrew, had been a county commissioner during the 1980s and ’90s and was the former state chair of the Democratic-Farmer-Labor Party. He quickly lined up support from some big names and nearly swept the house with organized labor. He also bested Hodges in fundraising and plowed much of that money into direct mail and TV ads. Hodges skipped television and went easy on the mail, instead opting for a multilingual canvassing crew, including a Somali organizer. She paid special attention to North Minneapolis. “It didn’t occur to me to do anything but a grassroots campaign,” Hodges says during a phone interview. “I get surprised that there are even other models.” Among her favorite books is Politics the Wellstone Way. The only union that supported Hodges was SEIU, which played a crucial role in providing funds and field staff. “The other unions thought we were insane,” says Javier Morillo, president of SEIU Local 26, which represents janitors and security officers. “But the Andrew campaign wasn’t reading the city as it is today—it’s a lot younger and has a lot more people of color.” TakeAction Minnesota also endorsed her. And yet, in what was billed as a tight election, Hodges beat Andrew by eighteen points. The Bethany Lutheran Church sits in the center of the Seward neighborhood, southeast of downtown. It’s the kind of neighborhood where a non–hierarchically run cafe jostles up against a radical bookstore and co-op grocery, and the local representative belongs to the Green Party. Before learning about Minneapolis’s deep poverty and racial inequity, this was the city of my imagination, a sort of radical utopia where the only oppression was inflicted by the winter weather. The church, however, offers a different narrative. Bethany Lutheran serves as the headquarters for Centro de Trabajadores Unidos en Lucha, or CTUL (pronounced say-tool). Inside, there is a bulletin board covered with photos of men and women protesting; a piece of butcher paper lists the sueldos robados—stolen wages—the group recovered in 2011. While the contractors listed are mostly small and unfamiliar, in recent years CTUL has moved up the supply chain, waging a campaign against the retail giant Target, which is headquartered in Minneapolis, hoping to organize the subcontracted janitors who clean the company’s stores. It is mid-June, and Mendez is standing in front of a crowd that includes staffers from NOC, SEIU and ISAIAH to announce a breakthrough: after a four-year campaign, Target has agreed to have its janitorial subcontractors sign “responsible contractor” agreements. Such agreements include a promise that the companies will negotiate with labor unions so as to avoid “workplace actions.” (CTUL workers held three strikes last year, and had threatened to strike during Target’s June shareholder meeting.) Contractors must also allow their employees to take one day off each week—a welcome victory for members like Maricela Flores, a janitor at a Target near Minneapolis, who reveals that she hasn’t had a day off in two years. While the agreement is in some ways a modest step forward—it will affect some 150 local workers who clean Target stores—it is the first crack in an industry traditionally written off by unions. CTUL will spend the next few months hammering on that crack, trying to get other big-box chains in the Twin Cities to follow suit. Those workers, if organized, will become joint members of both CTUL and SEIU Local 26. Janice Fine, a professor of labor studies at Rutgers University, sees the victory as a “groundbreaking advance” that could serve as a model for the future. “While unions and workers’ centers are working together more and more on policy issues, there are very few examples of joint organizing,” she says. In this way, the agreement is also a victory for what might be called a Minneapolis (or Minnesota) brand of organizing, based on unusually deep collaborations between groups on the left. These collaborations have a long history, beginning with the unlikely alliance of pious farmers and hard-drinking miners and meat-packers who formed the Farmer-Labor Party nearly a century ago. Looking forward, it is the current coalition of social-justice organizations gathered in this overheated church that promises to play a pivotal role in determining just how far the city’s progressive experiments go under Hodges. The seeds that grew into Minnesotans for a Fair Economy were planted out of frustration. It was the mid-2000s, a dark time for anyone in the state who cared about economic justice or racial equity. Paul Wellstone was dead, replaced by Republican Norm Coleman. Tim Pawlenty was governor. And a state senator named Michele Bachmann was planning a run for Congress. Their efforts have proved remarkably fruitful: a homeowners’ bill of rights, tax hikes on the wealthy, a recent increase in the minimum wage and, in 2011, the defeat of a proposed statewide amendment to restrict voting rights. Paradoxically, the coalition credits these successes, in part, to a general distrust of traditional coalitions. Members don’t even use that word to describe their work, feeling that it implies more of a quid pro quo relationship than building a real movement. They speak instead of being “in alignment,” settling on common targets—banks and other large corporations—and taking pieces of the work that fit their core missions and strengths. NOC may not hesitate to take over a vacant lot and plant a community garden; ISAIAH might mobilize tens of thousands of people through phone banks and congregation outreach; SEIU’s research department can discover the connection between the foreclosure crisis and school-budget shortfalls; and CTUL thrives on going up against long odds in dramatic fashion (workers once went on a twelve-day hunger strike in front of a store). Thus far, change in Minneapolis has been relatively slow. After Hodges’s first 100 days, she didn’t have a string of accomplishments to point to, such as de Blasio’s universal pre-K initiative or ending stop-and-frisk. Her first major initiative, which is in the early planning stages, is a “cradle to K” project that seeks to provide extra support to families with young children. Her recent budget proposal includes hiring two new staffers to focus on projects that reduce inequality; an additional $1 million for affordable housing; and $1.1 million to provide body cameras on police officers—an initiative she championed during her City Council days, and which has garnered increased attention since the fatal police shooting of unarmed Michael Brown in Ferguson, Missouri. If these are mostly modest endeavors, it is partly due to the institutional weakness of the Minneapolis mayor’s office. Unlike other big-city mayors, Hodges can’t simply appoint department heads; nor does she exercise control over the city’s school district, which is run by an outside board. But she does have a bully pulpit, as well as general agreement among the thirteen City Council members—with some notes of dissent from the Council’s president—that racial equity will be the top priority for the next four years. Thus far, however, the city’s Racial Equity Action Plan has been mired in the bureaucratic stage, with plans for steering committees, policy work groups and the like. “It has been very process-y,” says SEIU’s Morillo, not sounding entirely pleased. One chance to test the new racial-equity agenda has come in the form of a proposed expansion of the city’s light-rail system from Minneapolis to the suburbs. NOC and ISAIAH have been at the forefront of the campaign, seeking to ensure that residents of North Minneapolis are linked to the system and that improved bus shelters and reduced fares are on the agenda. And another fight looms around bank lending practices. In April, the University of Minnesota Law School released a report that found banks in the Twin Cities were engaging in redlining, most egregiously in North Minneapolis. During the subprime-mortgage craze, very-high-income blacks in the Twin Cities were nearly four times as likely to receive subprime loans as very-low-income whites. These days, however, banks are failing to make loans in these same neighborhoods to people who qualify for them. Wells Fargo, the area’s largest lender, is the worst offender, followed by US Bank. Here is racial inequity at its most stark: wealth stripped from neighborhoods like North Minneapolis through subprime loans, followed by a refusal to provide bank loans to people who qualify for them. One study estimated that foreclosures cost homeowners in the Twin Cities $723 million in wealth in 2012 alone. “Housing is going to be a very big issue,” says McGrath of TakeAction Minnesota. “How does [Hodges] hold those banks accountable?” In Richmond, California, the city has proposed seizing underwater mortgages through eminent domain, and other cities have successfully sued Wells Fargo for discriminatory lending practices. But it won’t be an easy fight. Wells Fargo recently invested $300 million in a Minneapolis development that includes two eighteen-story office towers, while US Bank is a hometown company.